Learning Is a Process Not an Event! About Bill Richardson – The Acrostic Guy! This acrostic is one of the most impactful frameworks for helping people change the way they interact with other people both one on one and in teams. Because we are hard wired as humans to be self centered especially when under stress, our communications often lack empathy and clarity. This acrostic serves as a behavioral script to help people press the “pause button” before speaking especially in high stakes situations. Once embedded as a habit its application can have a dramatic effect on both personal and business relationships. Main Idea: Test the veracity of what you are about to communicate by factoring in your current emotional state and the quality/quantity of information at hand. If you are in a highly emotional state there is very good chance your objectivity has been reduced and or distorted. Remember that truth can be a matter of perspective and highly influenced by culture and protocol. Main Idea: As in the truth, our perception of what is helpful is also a matter of perspective. Generally, when under pressure our ability or willingness to put curiosity in front of judgement is compromised. We are hard wired to judge the threat or reward nature of everything we perceive minute by minute. In these moments we need to exercise a certain level of discipline in order to accurately determine whether what we are about to say will be helpful for the relationship versus what will be helpful for us. Main Idea: I am reminded about an anonymous quote, “long after people forget your words they will remember how you made them feel.” Basically it means when you communicate or mobilize people to action, how you communicate your message will either inspire them to be committed and engaged, or discourage them to the level of compliance and helplessness. Before you speak, again hit the pause button to determine which you want, inspiration or discouragement. The bad news is that despite your best efforts to the contrary, your body language, tone and volume likely make the difference. The good news is all three of these elements can be easily changed. Necessary: Quite often in intense but friendly debates with my wife, especially about politics, I have caught myself going farther and deeper on particular point than is really needed or required. You might have witnessed this same phenomenon in the work setting where people will be more concerned about being right than actually learning either new information or better information about the other person’s perspective. Testing for “is it necessary” is perhaps one of the best strategies for communicating effectively especially in executive presentations. This is particularly true when the audience believes your intent is to show off versus be clear. In my coaching practice I promote the B.L.U.F approach – bottom line up front. 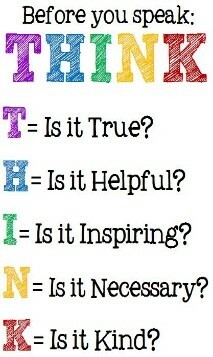 Kind: For me, this is the most important element in this wonderful acrostic. Testing for kindness is very seldom done in either the personal or business realm. In fact in my experience, kindness is sometimes considered a sign of weakness. The challenge for this one is that we deceive ourselves into believing that kindness takes time, a lot of energy and because we are busy and overwhelmed ourselves, we have an implicit licence to simply express ourselves. This is especially true when we are in a state of overwhelm because our company has launched more airplanes (aka projects and initiatives) than it can safely land. The fact is that we are social animals and how we connect with others makes the difference in how well we are able to cope with the pressures of today’s fast paced, multicultural business environment. Kindness matters as does this whole THINK acrostic.